This week was our last week of building new levels. Everything from here on out will be testing, fixing bugs and polish. That’s a pretty big milestone and I’m excited to have gotten this far and to still have a month and a half left to clean up the game. Our team is still anxiously waiting to find out if we were selected as finalists to the TERMINUS conference and even if we aren’t we’re still planning on launching the Steam Greenlight campaign soon. 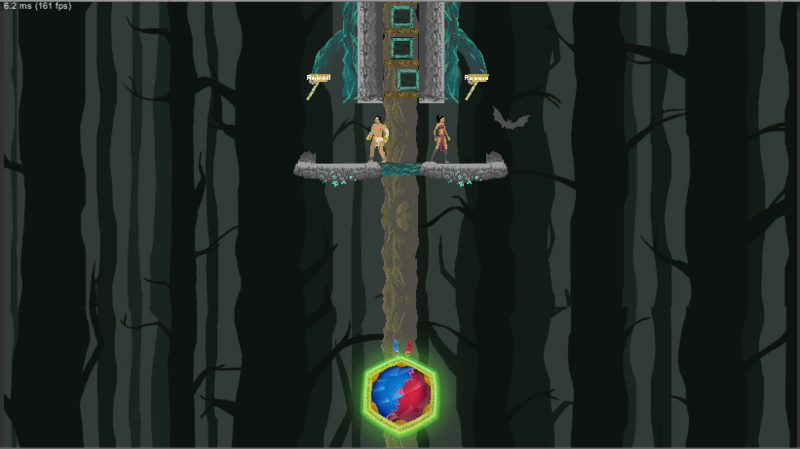 I built level 7, which serves as an introduction to the new mechanics the player will encounter in level 8. I also added in an updated version of something I worked on a couple months ago in our puzzle experiments. An elevator that travels up to the start of level 8 where the characters have to defend themselves from attacking animals as they ride up by throwing boxes at them. There are a few bugs to take care of but once they’re knocked out I believe this experience will give players something besides puzzles to enjoy. Created rough drafts of levels 7-9. Created boss art and sliced it to be ready for animation. Animated monkey prefab its ready to be implemented into the game. Researched and tested slope movement for the characters.